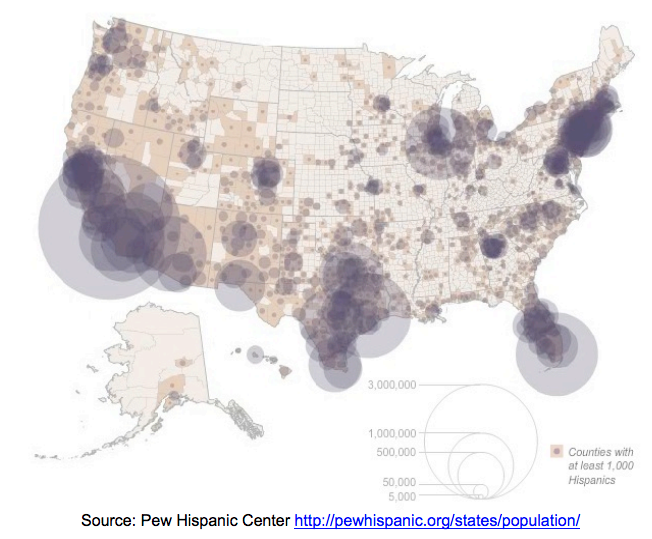 It is projected that Hispanics will account for 30 percent of the total USA population by 2050. With 44 million Hispanics in the USA today1 , having the ability to reach the Hispanic consumer is invaluable to any jewelry retailer, manufacturer or consumer brand. In 2005 MVI Marketing Ltd. (MVI) developed the first-ever measurement of the USA Hispanic Jewelry Market. In June of 2011 MVI began the development of a study to validate the findings of the 2005 research, quantify the progression of the market sizing and detail comparisons of the data from 2005 and 2011. The data for this report of findings was collected from multiple research instruments and deployments online. 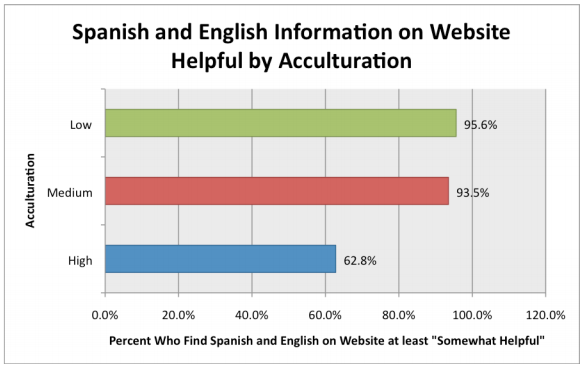 Respondents were able to complete the questionnaires in either Spanish or English. 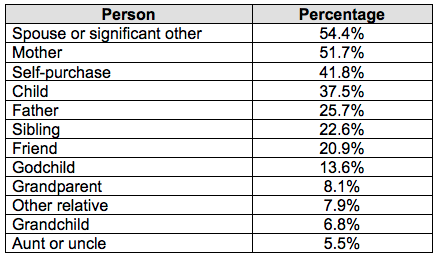 Level of acculturation in the USA was used to segment respondents. For the purposes of this research, Fine Jewelry is defined as jewelry made with precious metal, such as silver, gold or platinum with or without gemstones or diamonds. It also typically costs more than $50 retail. America’s 44 million Hispanics are the fastest-growing consumer group in the country. It is estimated that nearly 8 out of 10 (79.3%) Hispanic consumers in the USA will purchase at least one fine jewelry product in the next 12 months with a median retail price point of $250. The estimated market sizing for Hispanic Jewelry Market in the USA is now $8.7 billion. 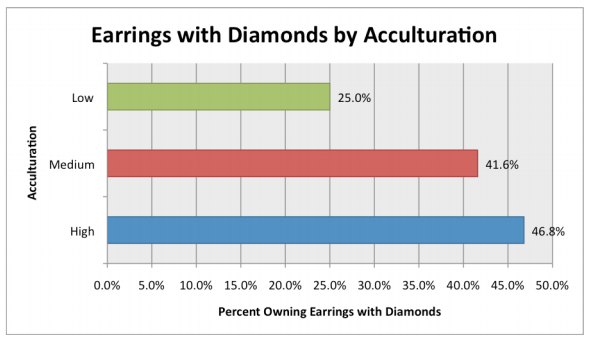 The acculturated Hispanic population is more likely to own diamond earrings and Hispanic women are more likely than Hispanic men to own bracelets set with colored gemstones. For each of the following styles of jewelry, please give us more information about what you currently own. Select all that apply for each. The desire to own different styles and categories of jewelry showed also some differences by the segments of respondents. 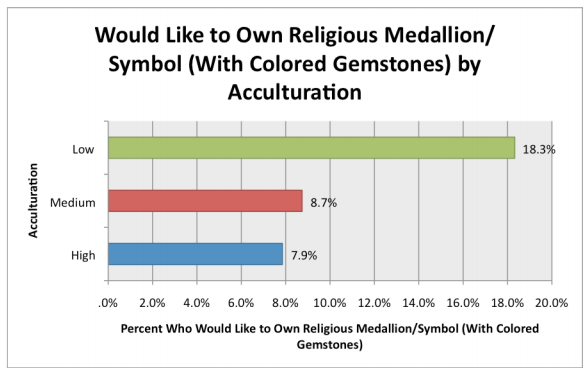 The low acculturated segment of the Hispanic population is more likely to be interested in religious medallions/symbols and brooches set with precious gemstones. Which of the following styles of fine jewelry do you not own, but would like to own? Select all that apply for each. 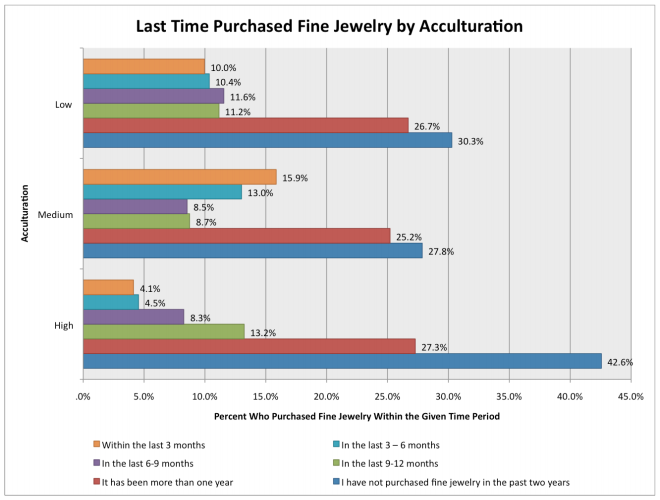 For past fine jewelry purchases, approximately 40 percent indicated they have purchased fine jewelry within the past year, with more than 11 percent purchasing within the past three months. Another one-quarter of respondents cited they have purchased fine jewelry in the last 1-2 years. Spending on past fine jewelry purchases was predominately below the $1,000 price point, with $201- $300 proving to be the most popular. Approximately how much did you spend on your most recent fine jewelry purchase in the past 3 months? 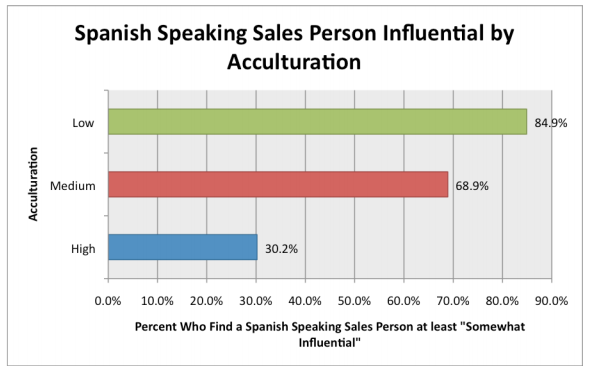 When looking specifically at the recency of purchase, the less acculturated Hispanic purchaser has made more recent purchases than those who are more acculturated. When was the last time you purchased fine jewelry? 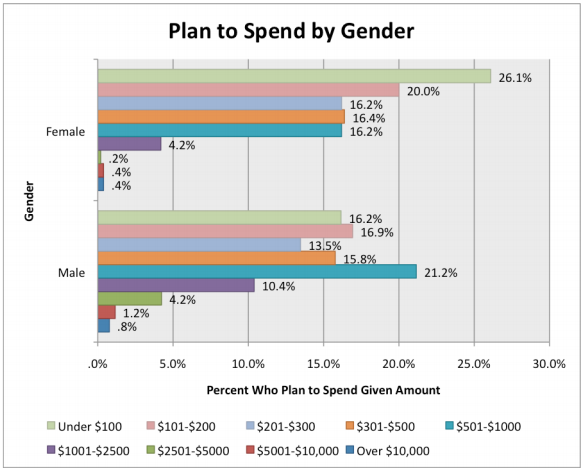 Spending on recent fine jewelry purchases was distributed differently by males and females. 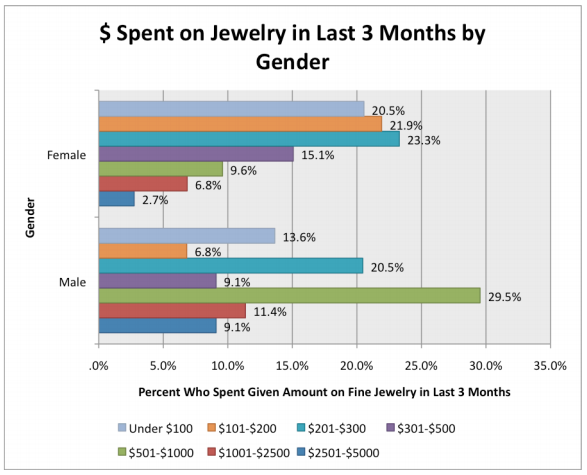 Women are more likely to spend within lower price points, while the largest segment of males spent $501 - $1,000 on their most recent fine jewelry purchase. 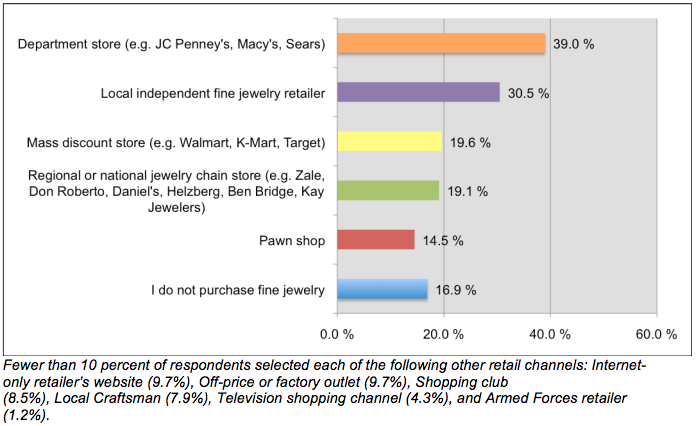 Where do you typically purchase fine jewelry? Select all that apply. Which of the following have you purchased for yourself? Select all that apply. What is the most you have ever spent on fine jewelry for yourself? How much do you plan to spend on fine jewelry in the next 12 months? 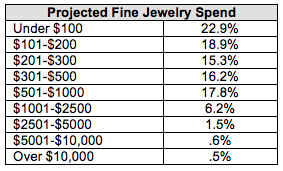 Again, to develop a better understanding of actual likelihood of spending this amount on their next fine jewelry purchase, respondents were asked to indicate their likelihood of spending this amount. Nearly 5 percent said there was no chance they’d spend this amount, while more than 6 percent are certain this is how much they plan to spend. Overall, nearly 45 percent believe there is at least a 50 percent chance this is the amount they will spend. Do you intend to purchase a watch in the next 12 months? How helpful do you find bi-lingual support when making a jewelry or watch purchase? Note: The higher the mean rating, the more helpful respondents found each service (on a scale of 1-to-5). How often do you purchase fine jewelry or watches as gift for others? For what occasions have you purchased fine jewelry or watches as gifts for others? (Select all that apply). 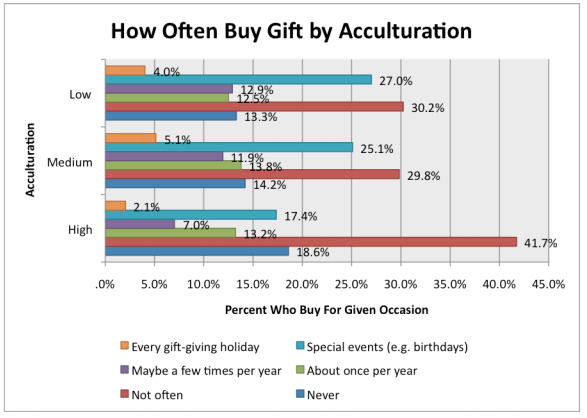 How much do you typically spend on fine jewelry and watch gifts? How familiar are you with the 4C’s of diamond quality grading? Do you have an insurance policy on any of your fine jewelry (other than through your homeowners or renters policy)? Why do you not have an insurance policy on any of your fine jewelry? Both the growth of the Hispanic population in the USA and the growth of the Hispanic Jewelry Market in the USA have been explosive. In 2005 JCOC estimated the market size to be $1.5 billion and in 2011 we are estimating the market size to be $8.7 billion, 5.8 times larger. Purchasing at independent fine jewelry retailers has remained strong with the Hispanic Jewelry Consumer since 2005, a significant bright spot for this retail channel during a time period when market share has declined in many categories. Positive growth has been achieved by department stores with the Hispanic Jewelry Consumer from 2005 to 2011. Not surprising given the attention stores like J.C. Penney’s, Kohl’s and Sears devote to bilingual staff, product development, store signage and marketing support. 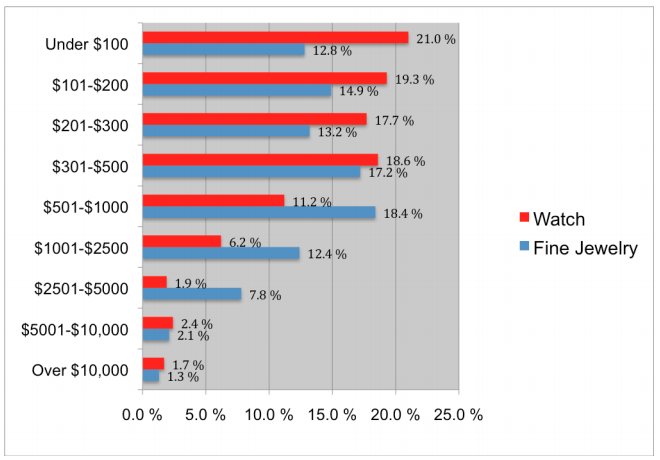 From 2005 to 2011 Walmart continued to be strong in the mass discount store category and Amazon.com continued to dominate the Internet sales among Hispanic Jewelry Consumers. Interestingly both of these retail outlets have significant closing ratios as determined by consumers who visited the store or website and actually made a purchase. 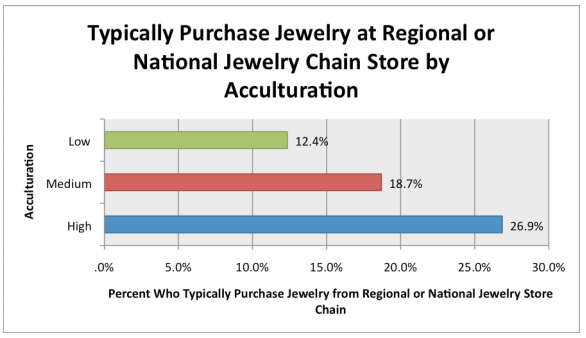 Local retail jewelers and family/friends remain strong sources of information about fine jewelry, but there was a significant increase in the use of the Internet, by Hispanic consumers, to source information about fine jewelry in 2011. Over 90% of respondents reported purchasing fine jewelry or watches for themselves in the 2011 study as compared to nearly 65% in 2005. The peak price points for self purchases also increased from the $301--$500 range in 2005 to the $501-$1000 range in 2011. There are very few geographic regions in the USA that have not seen an influx of Hispanic consumers in the past decade. There are very few geographic regions in the USA that have not seen an influx of Hispanic consumers in the past decade; as such retailers, brands and manufacturers should develop targeted and translated marketing support materials to welcome Hispanic Jewelry Consumers. Know your local market intimately. The Hispanic consumer segment is large, diverse, changing and moving. The more you learn about the particulars of your local market areas the more effective your marketing efforts will be. Your Internet presentation is extremely important to the Hispanic Jewelry Consumer. Translated pages on your website are a must. The Hispanic consumer, like all consumers is searching and researching their purchases before buying. A translated version of your store or brand website is an inexpensive way to make a great first impression. This is critical both for fine jewelry retailers and fine jewelry manufacturers including watch brands. Use you website to build brand loyalists who will become advocates for your brand among their friends and family. Capture data on these brand loyalists that visit your website in exchange for discounts and special offers. Enter the data into your CRM software and use it for future, targeted marketing initiatives. Have a staff meeting to discuss, plan and strategize on your business initiative and approach to targeting the Hispanic Jewelry Consumer. Involving your staff early in the process will increase their excitement and ownership of the initiative. It will also yield significant benefits in terms of grass roots ideas and action steps that you can implement cost effectively to generate business. Have regular meetings and training sessions with your staff to follow up on this subject. Keep the meetings very focused, short and action oriented. Bilingual staff is a must in heavily populated regions with a high percentage of low to medium acculturated Hispanic consumers. While less significant for highly acculturated consumers, the welcoming effect is still very powerful and will make your retail store or brand that much more inviting and appealing. Marketing campaigns across multiple platforms (radio, billboard, television, print, direct mail, web, social media etc.) will provide both insights into your target customer and sales. All campaigns must be measurable and monitored intensely for efficacy of spend. Always test before rolling out. The Hispanic Diamond Consumer is a large growth opportunity at retail. Retail buyers should work with their manufacturers to develop targeted product and marketing support that will entice this market. There is little to no awareness as yet of the 4C’s and gem grading lab certificates among Hispanic consumers. This is a great educational opportunity and a way to build loyalty and trust. Both retailers and manufacturers should work with their gem laboratories to encourage them to produce Spanish language certificates (or bilingual certificates) and educational brochures for all diamonds and gemstones. The Hispanic Watch Consumer also appears to be a significant growth opportunity for fine jewelry retailers. More than half of the respondents indicated there is at least a 50 percent chance they will purchase a watch in the next 12 months. Jewelry retailers should work with watch brands to increase marketing spends and targeted campaigns for this consumer in their specific local markets. Insurance for high value purchases should be readily available and discussed at retail. Retailers should work with their insurance agencies to produce targeted, translated educational materials, which will make the Hispanic consumer aware of their insurance options. Host a special Hispanic holiday event. For fine jewelry retailers: set up a special section of your store displays and showcases to attract the Hispanic Jewelry Consumer. 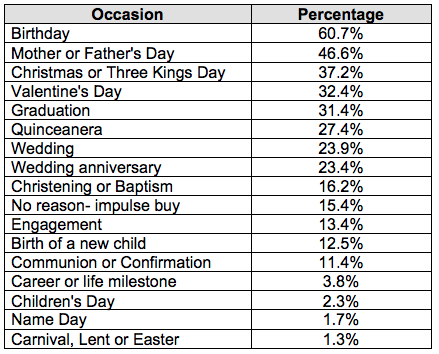 This section should be related to specific events on the calendar or in your community. Include special products (e.g. religious pendants if you are in a heavily low acculturated community) and translated posters, translated duratrans, warranty information etc. Host special education events to teach younger Hispanic consumers about gems, jewelry and watches. Reach out to local organizations and offer your services for educational speaking opportunities that will reach the Hispanic consumer. Hispanic families are drawn to the churches in their communities as a central part of their lives. Local church events and activities are great awareness and brand building opportunities. Radio, particularly in major markets, is now dominated by Spanish language channels on both AM and FM. Hispanic radio audiences are growing rapidly and you can easily target and test your marketing spend with radio stations. The number of Hispanic radio listeners increased 1.1 million last year as stations picked up on programming formats for Spanish-speaking audiences. For example, Texas now has 154 Spanish-language stations, up from 25 in 2000. Sporting events are also a strong opportunity to target marketing to the Hispanic Jewelry Consumer, particularly soccer but also baseball. Have female staff available to work with self-purchasing Hispanic female consumers. This consumer is a heavy purchaser of fine jewelry set with colored gemstones and you must have inventory and a female sales associate that understands the fashion accessorizing business. This is not necessarily a gemological purchase but rather a fashion forward statement. Use CRM software to collect and categorize your customer and prospect data. Target specific marketing and communications to specific groups of people at specific times. Do not rely on large, broad based marketing and communications approaches but rather test and laser focus spends and expand the ones that work. 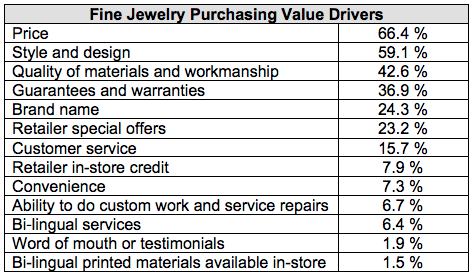 After price the top three value drivers for Hispanic Jewelry Consumer purchases are as follows. Use your marketing and sales support to highlight each of these components when working with the Hispanic Jewelry Consumer. Take note of best practices from other non-jewelry retailers and brands in your area. Major non-jewelry, consumer goods retailers are already targeting Hispanic consumers with product development and marketing support. Many large consumer brands are doing the same. You can emulate their initiatives and adapt them to your brand or store. For example, Olay organized an event for 180 Latino women and their guests, who experienced the brand’s Total Effects (TE) skin care line at a mansion in Los Angeles. The contest was promoted through a partnership with Univision with online registration at www.olayparati.com. Afterward, all participants reported that they would use Olay and recommend the brand to other women. Don’t ignore the youth. Traditional jewelry retailers, manufacturers, brands and the industry as a whole tend to still be focused on the last generation. With the Hispanic Jewelry Consumer the real growth opportunity is with the next generation. Bring them in early and they will stay with you for a lifetime. The publisher hereby disclaims all warranties related to this report. Specifically, this report is provided "as is" and "as available." To the maximum extent permitted by law, publisher expressly disclaims any and all warranties, express or implied, regarding this report, including, but not limited to, any implied warranties of merchantability, fitness for a particular purpose, or non-infringement. Publisher does not warrant that the report will meet your requirements or that the report will be complete and error-free. Publisher periodically adds, changes, improves or updates the materials in reports without notice, and as a result, publisher does not make any warranties or representations as to the accuracy or completeness of any such materials in reports. The information in reports may contain errors, omissions, problems or other limitations. We and our affiliated parties have no liability whatsoever for your use of any information in reports.